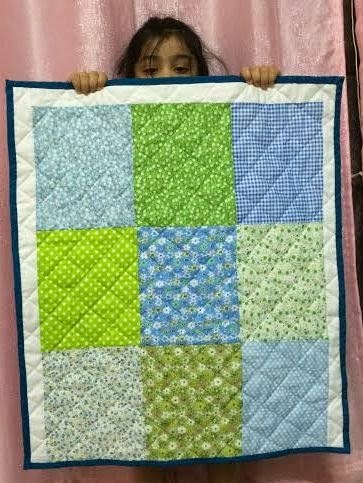 This baby blanket took just one day to make following many ideas from Sewcanshe.com.. enjoyed making it..The fabric was purchased online from Aliexpress.com , they come in easy 40cm by 50cm packages with coordinated colours. 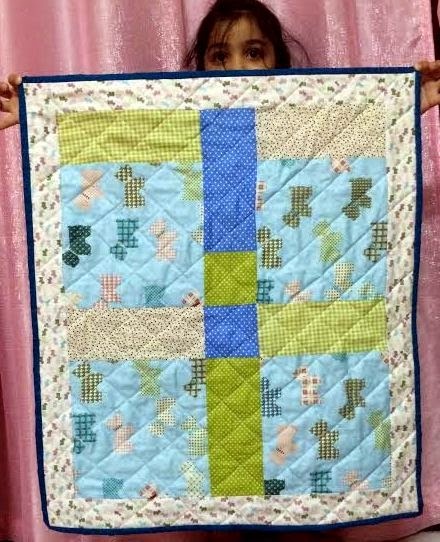 I liked the dog print a lot and the sashing fabric on the corners also have small dog print... for making straight lines I used basking tape... i followed many ideas learnt from Sewcanshe over last 2 years and quite happy with what I accomplished. Thank you Caroline of SewCanShe. I am quilting since 2 years only and this is my4th quilt so far other than small projects.